Outdoor activities are increasing across the world. Developed regions such as the U.S. and Europe have a long tradition of participating in outdoor activities. According to Outdoor Industry Association (OIA), in the U.S., approximately 49.0% of the population aged over six years (which is 146.1 million), participated in at least one outdoor activity in 2017. From 2006 till 2017, outdoor participation in the U.S., averaged above 40.0% of the U.S. population above six. In 2017, outdoor participation in the U.S. was 49.0%. In Europe, outdoor activities are promoted by the European Outdoor Group (EOG). The EOG has developed a long term vision for the European outdoor industry till 2020. Thus, rise in outdoor activities is increasing the demand for outdoor clothing products across North America and Europe. The study provides a conclusive view of the global outdoor clothing market by segmenting it in terms of product type, consumer group, and distribution channel. In terms of product type, the outdoor clothing market has been classified into top wear, bottom wear, and others. Top wear outdoor clothing products are further subcategorized into shirts & t-shirts and jackets & hoodies. Bottom wear outdoor clothing products are subcategorized into trousers, shorts, and leggings & tights. The others product category includes hand wear, head wear, gloves, warmers, etc. Based on consumer group, the market is classified into men, women, and kids. Based on distribution channel, the market is segmented into online and offline. The distribution channel of offline outdoor clothing products are further subcategorized into large format stores, specialty stores, and individual retailers. Globally, outdoor activity adoption is increasing among the rising millennial population, subsequently increasing the demand for outdoor clothing. Across the world, manufacturers of outdoor clothing have a good opportunity to expand in the unexplored markets for outdoor clothing made from natural fiber. This is evident from the recent acquisition of Icebreaker Holdings, Ltd. by VF Corporation in April 2018. Icebreaker Holding manufactures outdoor clothing made from merino wool. Similarly, Patagonia which manufactures outdoor clothing made from natural fibers is also expected to increase its revenue in future by manufacturing outdoor clothing products made from natural fibers. Across the globe, there is a general trend among consumers to stay slim, trim, and healthy. In developed regions such as the U.S., Europe, and Japan, outdoor clothing manufacturers are attracting aging but active consumers and in emerging economies such as Asia Pacific and South America, outdoor clothing manufacturers are attracting the younger population.Globally, women are increasingly taking up outdoor activities. In many developed countries such as the U.S., Canada, Germany, U.K., France, Italy, etc. the population of individuals of 15 years and more generally have a higher share of female population. Thus, the women’s outdoor clothing segment needs to be further tapped. Although there is a rising demand for outdoor clothing products across the world, there is also an increase in counterfeit outdoor clothing products. These counterfeit products are increasing their presence on social media such as Facebook and Twitter to increase their sales.In January 2018, Canada based outdoor clothing manufacturer Canada Goose filed a case against Chinese web counterfeiters for selling counterfeit outdoor clothing products containing the trademark of Canada Goose. Counterfeit outdoor clothing products are a major issue for established global outdoor clothing brands such as The North Face, Columbia Sportswear, Patagonia, etc. Outdoor clothing large format stores or departmental stores are decreasing in number across the world, mostly in developed regions such as North America and Europe due to rising e-commerce penetration and decrease in consumer footfall. On the other hand, specialty outdoor clothing stores are increasing in number across the world. China is seeing an increase in the number of specialty outdoor clothing stores. The report highlights major companies operating in the global outdoor clothing market including Adidas AG, Columbia Sportswear Company, Hanesbrands Inc., VF Corporation, Hugo Boss AG, Mizuno Corporation, Nike Inc., Puma SE, Under Armour Inc. and Patagonia, Inc. This report on the global outdoor clothing market provides analysis for the period 2016–2026, wherein 2017 is the base year and the period from 2018 till 2026 is the forecast period. Data for 2016 has been included as historical information. 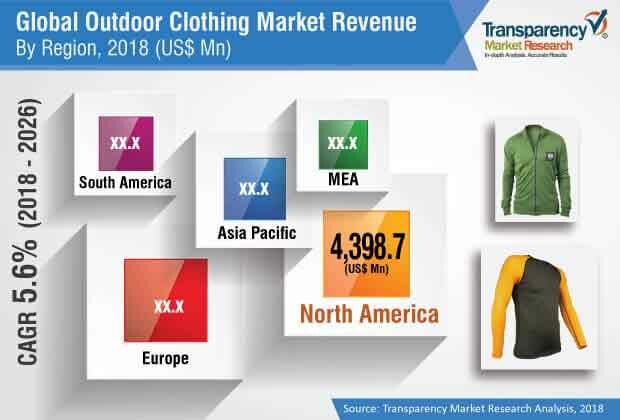 The report covers market dynamics including drivers, restraints, opportunities, and trends that are expected to influence the expansion of the global outdoor clothing market during the said period. The study provides a comprehensive analysis on market growth throughout the above forecast period in terms of value estimates (US$ Mn) and volume estimates (‘000 Units) across different geographies. Across the world, e-commerce has influenced all industries. The retail industry including apparel retail is also influenced by rise in e-commerce. It is expected that in future, the e-commerce channel in the overall retail industry will become the largest channel.Rise in smartphone penetration, and increase in choice and convenience are increasing the sale of outdoor clothing products across the world. In Asia Pacific, emerging economies such as China and India are seeing increase in e-commerce penetration in the outdoor clothing industry and the overall retail industry. In China, e-commerce penetration in the overall retail sector is higher than in the U.S. and other developed countries. Among consumers, millennial spend more time on their smartphones and are the largest purchasers of outdoor clothing online. All these factors are driving the demand for outdoor clothing across the world. According to the European Outdoor Group (EOG), outdoor clothing penetration is increasing in Europe. EOG member companies are conducting trade shows and marketing activities as part of their Vision 2020 strategy to increase participation of Europeans especially women in outdoor activities. Outdoor clothing made from natural fiber presents a good growth opportunity for global outdoor clothing manufacturers. According to global outdoor clothing company, VF Corporation, natural fiber outdoor clothing is still an unpenetrated market, thus offering good opportunities. The study provides a conclusive view of the global outdoor clothing market by segmenting it in terms of product type, consumer group, and distribution channel. In terms of product type, the outdoor clothing markethas been classified into top wear, bottom wear, and others. Top wear outdoor clothing productsare further subcategorized into shirts & t-shirts and jackets & hoodies. Bottom wear outdoor clothing products are subcategorized into trousers, shorts, and leggings & tights. The others product type category includes hand wear, head wear, gloves, warmers, etc. Based on consumer group, the market is classified into men, women, and kids. Based on distribution channel, the market is segmented into online and offline. The distribution channel for offline outdoor clothing products are further subcategorized into large format stores, specialty stores, and individual retailers. The analysis of the above segments is based on present and forecast global demand for outdoor clothing products and prevailing and future trends in the global outdoor clothing market. We have analyzed the present and estimated regional market size of outdoor clothing products across North America, Europe, Asia Pacific, Middle East & Africa, and South America. The regional outdoor clothing market size is further broken down into country level markets in the following countries: the U.S., Canada, Germany, U.K., France, Italy, China, India, Japan, and Brazil. The global outdoor clothing market consists of global players as well as large number of medium and small players. VF Corporation’s outdoor clothing brand “The North Face” holds a significant market share in the global outdoor clothing market. Columbia Sportswear Company, Nike Inc., Patagonia, L.L.Bean, Timberland LLC, etc. are other players in the global outdoor clothing market. The report includes a detailed analysis of the global outdoor clothing market, SWOT (Strength, Weakness, Opportunity, and Threat) analysis of the market, Porter’s Five Force analysis, key macroeconomic indicators influencing the market, and raw material analysis. The industry analysis includes value chain analysis of the global outdoor clothingmarket. The outdoor clothing market is driven by consumers. Companies selling branded outdoor clothing control a major portion of the outdoor clothing value chain by outsourcing outdoor clothing production to Asia Pacific countries such as China, Bangladesh, and India, where labor cost is low. There are six value-addition activities in the global outdoor clothing market: Research & Development (R&D), Design, Production, Logistics (Purchase & Distribution), Marketing & Branding, and Services. Production, which adds the least value to the outdoor clothing market is outsourced to Asia Pacific due to the region’s low labor cost. Outdoor clothing brands focus on R&D, design, and marketing to increase their share in the global outdoor clothing market. These market players have been profiled in terms of attributes such as description of the company, financials (if available in the public domain), products, key strategies to increase market share, and recent developments and strategies adopted to increase their market share in the outdoor clothingmarket.